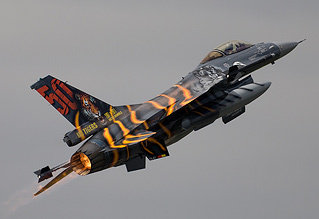 Cambrai Épinoy - Base Aérienne 103 played host to this year's NATO Tiger meet, which significantly marked the 50th Anniversary of the first Tiger Meet at RAF Woodbridge in 1961. 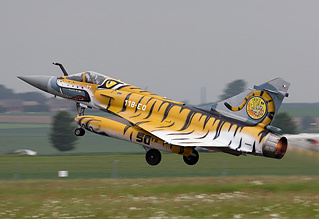 These events originally involved squadrons with a Tiger motif on their various crests, although this requirement has since been relaxed to include other big Cats. Dismissed wrongly by some as an excuse for a glorified junket, it is one of the few exercises where squadrons from the various member nations can train together and exchange ideas and tactics. 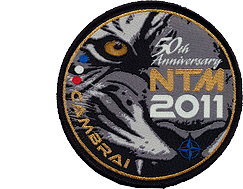 Michael Hall reports from France for the 50th meeting of the NATO Tigers. This year's event was particularly poignant for the hosts as this would be their last such event, since the Armée de l'Air has decided to close the airfield at Cambrai and disband Escadron de Chasse 1/12 Cambrésis in 2012. As regular followers of these meets are aware this is especially sad as the squadron always embrace these events and have in recent years provided some of the more flamboyantly decorated airframes. One result of this being the last such event at Cambrai was that a great deal of interest was shown by enthusiasts. To cater for the resultant demand no fewer than three "Spotters" days were organised, on the 11th, 16th and 17th May. 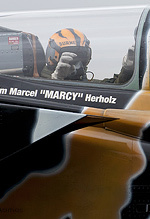 Various support aircraft and adversaries visited Cambrai during the exercise as well as some of the participants present for the Tiger Meet airshow held at nearby Niergnies. A sign of the current European economic climate was the not entirely unexpected cancellations of several of the invited participants. 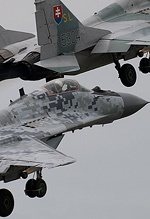 Their numbers were joined by the Norwegian and Dutch F-16s due to commitments as a result of recent world events. Various other member squadrons cut short their stay at Cambrai, notably the Spanish Mirage F1s of Escuadrón 142 and a Royal Navy Merlin of 814 Squadron who were present only for the weekend which marked the mid-point of the exercise. On a brighter note Mira 335 of the Hellenic Air Force, with their smart Block 52+ F-16s, was promoted to full member status. Many of the participants arrived carrying Tiger markings, the Luftwaffe Tornado IDS of AG 52 taking the trophy for this year's best scheme. Various transport and communication aircraft supported the event including a Polish Air Force C-130E that bought a replacement engine for a sick F-16C on the 16th. The Patrouille de France brought along a support Transall whose shabby appearance was soon forgotten after witnessing the spirited banking departure over the ramp. Various other Tiger themed elements were in evidence at Cambrai including a giant inflatable Tiger's head, a Tiger striped fuel tanker and the usual array of Tiger marked cars. For a greater insight into the nature of the missions and to hear from the crews involved, there are some informative online magazines available to download from the Armée de l'Air website. Next year's NATO Tiger Meet will be held on 28th May to the 8th June at Monte Real in Portugal.